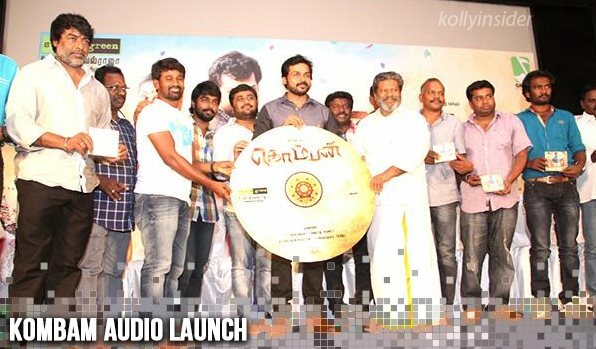 Today, (March 5) the audio launch of Karthi's Komban took place at Prasad labs, Chennai. Speaking at the function, Karthi said, "After Paruthiveeran, I was little apprehensive in choosing a village subject because people would definitely claim that a particular dialogue or my particular expression reminds my role in Paruthiveeran but when Muthiah narrated the script of Komban it had an unique characterization". The handsome hero Karthi is going the rural way again with Komban. He has put on weight for Komban and his Singam mushtache is already a hit. A brand new trailer and one song were shown at the function and the visuals are promising. Studio Green is planning to release Komban on March 27 in more than 400 screens across Tamil Nadu. Directed by M Muthaiah, Komban has Lakshmi Menon, Rajkiran and Kovai Sarala. GV Prakash has scored music and cinematography is by Velraj with Praveen KL's editing. Produced by Studio Green, Komban is expected to be a action comedy drama. We now have some more interesting news about Komban. Karthi plays a man of good nature and audience will fall in love with Komban who will have a tug of war with his father in law. This relationship and the controversies will be hilarious. Kovai Sarala is playing a serious character role after many years. The director is said to have written the script based on a real life incident. so, Komban is going to be some one very easy for the audience to relate and accept. Studio Green proudly presents Karthi's "Komban"